Goji is a red colored fruit, similar to a baby tomato in its look. They are seen in the Himalayas and are sweet, large and plump. It is renowned for its anti ageing properties. Also referred to as wolf berries, Goji berries are a storehouse of 8 essential amino acids. They are devoid of carbohydrates. They contain a polysaccharide. In addition, few components in the plant enable them to decrease the loss of cells from the body. They help in the development of new cells in a rapid manner. This is the theory behind its usage against ageing. Cessation of old cells result in the production of new cells. The rate at which these are synthesised reduces with age. The strength of the digestive system is improved. The fruit is a good source of 21 trace minerals and 19 amino acids. Zinc, selenium, phosphorus, calcium and germanium are the various minerals seen. They also comprise Vitamin E, which is generally not seen in fruits. About 500 times the amount of vitamin C by weight of oranges is seen in these wolf berries. Anti carcinogenic property is seen to be exhibited by these fruits. Beta sitosterol, which helps in lowering cholesterol levels are seen in goji berries, in addition to beta carotene. Dried goji can store well for up to one year. In high humid environments, store them inside the refrigerator for extended lifespan. Completely ripe, fresh berries can be eaten handpicked straight from the bush. Being a member of solanecece fruits, eating unripe goji could be toxic and therfore, should be avoided. Dried berries can be consumed on their own like raisins. Soaking them in lukewarm water for 5-10 minutes makes them soft and plump. Jujube fruit, wolfberry, chicken soup. Fresh berries can be eaten out of hand as in grapes. Dry fruits can be used in a much similar way like raisins, in cakes, tart, bread, muffins, etc. Add them in tea with lemon. 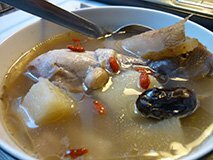 Dried berries can be added in soup with spices and shredded chicken. 1 packet 200gm Fresh Bulk Goji Berries.